Bream Angle and Spread. Click to enlarge. Bulbs with narrow beams (12° for example) are commonly referred to as spots. Wider beam bulbs (60° or so) are known as flood or wash lights. Many times you will not be able to adjust the distance between your fixture and subject so you’ll have to calculate which beam angle is the best fit. If you have the flexibility to vary the distance you may have the option of choosing between two beam angles. The beam spread is the diameter of the projected light at the subject. In other words if you shine a flashlight on a wall, the width of the circle of light will be the beam spread. We measure this in feet. 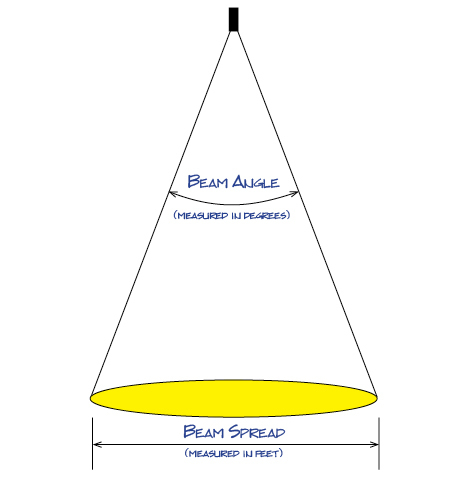 For this discussion we consider the beam spread to be the area that is illuminated by 50% of the light power. Simply put this is the distance between the fixture and the object that you are lighting. For example a 38-degree beam angle bulb placed 30′ from the subject will result in a beam spread of 20.52 feet. Your calculation will look like this: 38 x .018 x 30 = 20.52. If you are not into the math and just want quick answers use one of our handy calculators below. This article is intended to give you a general guideline for choosing the correct bulb for your fixture. As mentioned, there are many other considerations when determining the optimum bulb for your fixture. If you would like to go into more detail we are available for discussion. We offer free consultation and design we’d love an opportunity to work with you. Our contact information is below or you may visit our FREE CONSULTATION page to schedule an appointment.